Engage students with holiday fun! 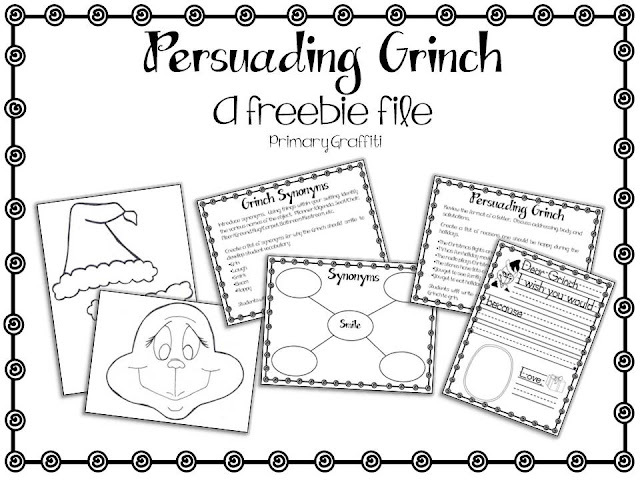 Persuade that Grumpy Grinch to Grin with this simple freebie. I provided my kinders with persuasive format that would allow the kids to focus on the content verses the format. What a fabulous freebie! Definitely pinning and using during Grinch days :) Thanks friend! Yay! I've been missing some grinch in my life! This is in the plans for next week. Thanks, Cheryl! Thanks for the freat Grinchy freebies- love 'em! This is great. Thank heaps. I love your stuff. O love this! Thanks! I was looking for your other grinch freebie I found on pinterest of how the grinch changes in the story. Do you have it that you could email to me? thanks! LOVE this little project! We've gone Grinchy in my room, and I've been looking for a good writing prompt for my little firsts. Can't wait to try it!